More than a million tickets go on sale next month for an explosion of Shakespeare productions that will coincide with the London Olympics. They will involve thousands of actors, hundreds of professional and amateur theatre companies, and scores of languages, all part of the biggest Shakespeare festival  ever organised. Details were announced as new research commissioned by the Royal Shakespeare Company and the British Council revealed that the bard is the world’s most studied author, pored over by half the world’s schoolchildren, at least 64 million each year. His work is a compulsory secondary school subject in countries including Azerbaijan, China, Oman, the Philippines and Vietnam. 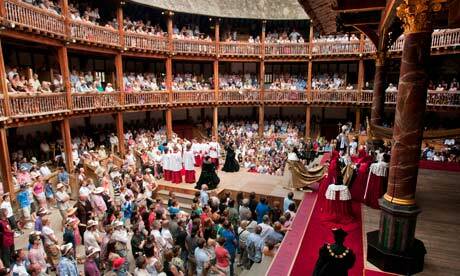 The Globe , the recreation on Bankside in London of Shakespeare’s own theatre, is mounting all 37 of his plays, presented by guest companies in 37 languages, including Arabic, Yoruba and Armenian. Globe artistic director Dominic Dromgoole is particularly proud of including a company from “the newest country in the world, South Sudan, which has yet to celebrate its first birthday”. It will perform in Juba Arabic. An Iraqi company is bringing a Romeo and Juliet, where the warring families are Sunni and Shia, and a company from Tunisia is staging a version of Macbeth looking at power and repression among Arab leaders. The Barbican is hosting Yukio Ninagawa ‘s production of Cymbeline in Japanese. Michael Boyd, artistic director of the RSC , said promised they will be “outrageously collaborative”. At Stratford-upon-Avon, Russian director Dmitry Krymov will present the world premiere of his version of A Midsummer Night’s Dream in Russian, a Brazilian company using circus skills is tackling Richard II and the National Theatre of Mexico is creating a political thriller about the Aztecs, based on Shakespeare’s history plays.